Our range of products include dog coat and dog winter coat. Backed ourselves with sound amenities and talented personnel, we have emerged as the leading firms of superior quality of Dog Coat. The offered coats are especially designed for dogs, ensuring complete protection in winter and rainy season. 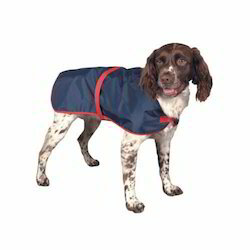 Our offered dog coat is warm and soft that increase its market demand. Light in weight and skin friendly collection is made available for our customers' at nominal prices. With the help of our state-of-the-art infrastructure unit, we are able to manufacture, export and supply the superlative quality of Dog Winter Coat. This dog blanket is widely acknowledged for the colour fastness and soft texture among our clients'. Smooth and soft in touch, the blankets are generally designed for providing warmth to the dogs. Our durable dog blanket not only possesses warmth but also avoids moisture and dries very fast. Due to the light weight, skin friendly nature make these blankets demanded in market.